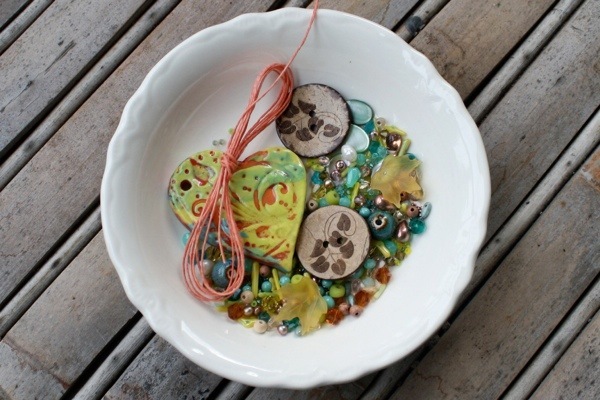 Remember I wrote about the Bead Soup Blog Party a while back? Well, I mixed up my soup, added a few ingredients and off I went to create some jewels! This is the second year I have taken part in the ‘Pretty Things’ Bead Soup Blog Party and it is always so much fun. From the initial partnering up to the excitement of receiving my bead soup in the mail, to the making of the final pieces. Here is what I made last year, I have to say I am still a little in love with that butterfly ring. I knew I wanted to make a ring this year and I also wanted to use linen thread in the main piece. One of the coconut buttons begged me to be a ring and who was I to argue? The salmon hue of the linen complements the heart focal perfectly I think. Thanks to Cassi of Beads: Rolling Downhill blog for my lovely Soup, I can’t wait to go and see what she did with the beads I sent to her. Click on the link to pop over and take a look. I made the lovely button ring, simple, but such a pretty button, what else does it need? 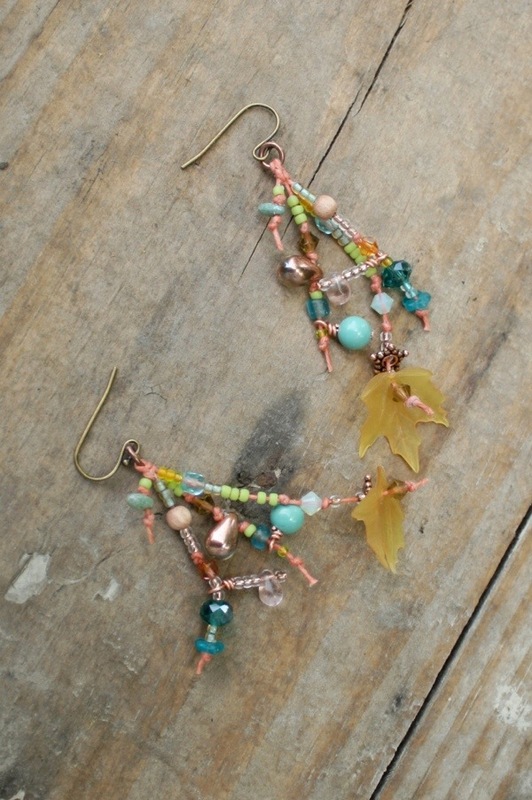 The earrings are one of my favourite designs, dramatic with out the weight. Summery casual or evening beauty. Just look at that clever little heart, it is gorgeous and reversible. Yellow mood? Blue mood? You decide! This is a long long necklace at thirty inches and I a super happy with how it turned out. Thanks again to Cassi for the beads and the ever wonderful Lori of Pretty Things blog for organizing the whole darn thing, a brilliant job as usual. Want to see more? I do. Let’s go and see what everyone made – here is the link. Great designs. I just love the long necklace. I use a lot of waxed linen but for some reason feel compelled to cover it rather then letting it stand as a design feature. Those earrings are awesome and I love the summery feel of your necklace. I really like that necklace with the heart focal. It looks very “summery” and versatile enough that you could wear it with casual clothes, business attire or even to go out at night. Nice! 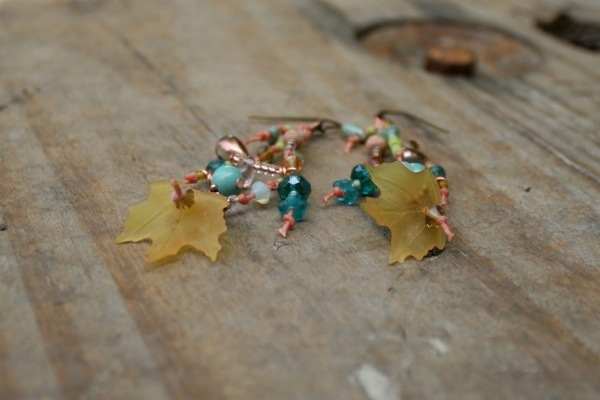 Those earrings are fantastic – so light and summery! I love what you did with those “soup” components! Beautiful! Great creations. I especially love what you did with the waxed linen. 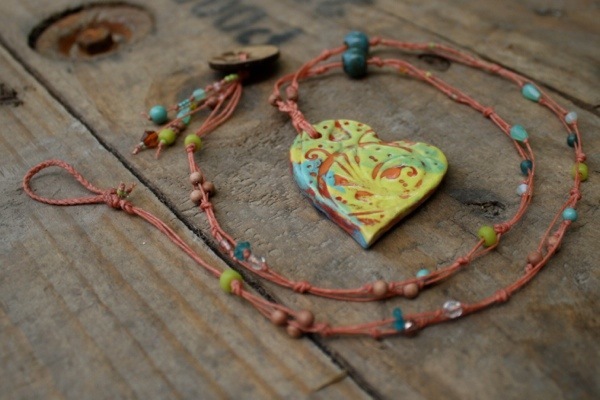 Beautiful boho style necklace, Clare! Love it!!!! Very, very pretty pieces — every one of them! Thanks Becky, I was happy with how they turned out. Lovely work. And great idea with the button ring. Such a lovely happy necklace and fantastic earrings!! You made a wonderful collection of soups! I love your necklace and earrings. I also agree those earrings are definitely show stoppers without being drag-your-ear-down dramatic. I’m sure a lot of people would enjoy wearing them! The button ring is crazy good! Then you used the button as a clasp for the beautiful necklace. Love your creativity and designs! I love your whimsical creations. They all scream summer fun to me. What a great job with a lovely soup. Love all your pieces, very fun and creative! I just hadto visit your blog because we both have cats themes going on. What simply lovely buttons I liked the simplicity with the ring and thenecklace that matches it. Love your pieces, especially the ring! Thanks for stopping by my blog too! What a great job you did with your soup! Love the ring – the earrings and the necklace is fun and stylish! What a beautiful set you made with your soup. Love that necklace and you are so right. That linen is perfect with that heart. Love the little earrings. They dangle so pretty. Great job! I lvoe the necklaces, but the earrings are my favorite, so dangly and colorful!!! very elegant and feminine projects! superb! Very beautiful designs you’ve done. I love all of them but the little button ring is so loveley. He’s my absolutly favourite. 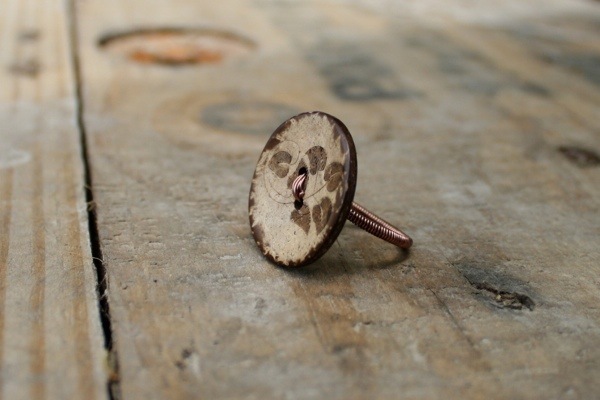 Such a sweet little button ring! And the necklace is my favorite, too. I like the simplicity in them, it makes them fresh and happy, not a bit overdone, what so easily happens (to me). love the ring…but REALLY love the necklace! Excellent job! You’re right that button ring is simply perfect. I love your style . Everything is simple and beautifully done. Wonderful pieces! I really love the necklace. 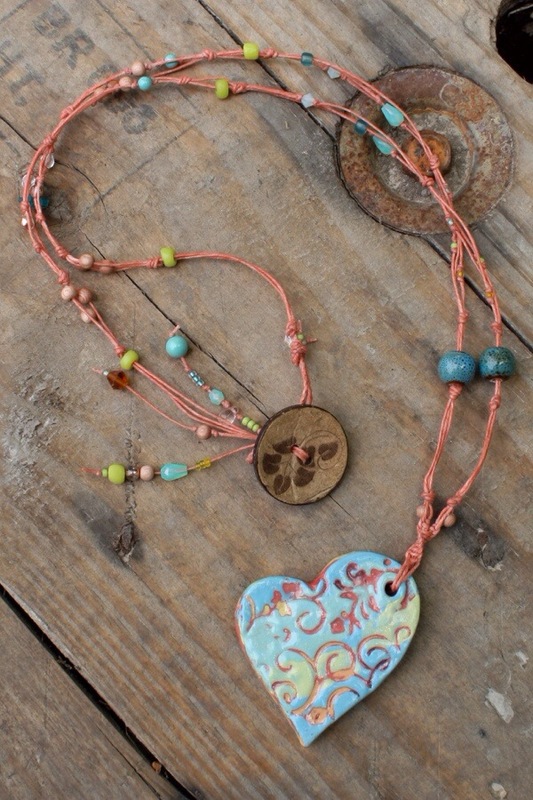 It’s style and choice of cording and beads really compliments the pretty heart focal. What’s not to love about what you created here? First off, the palette of colors you received from your partner was just so yummy. That button ring is really beautiful. I also like your necklace. The simplicity in how you pulled the colors and beads together with the focal and button closure. . .it looks like they all belong together! Beautiful pieces, love all your designs, great job! Your pieces are wonderful. I love the simple beauty of the ring! And the necklace and earrings are so colorful and wearable. Great work! Everything you made is so beautiful – the ring is an eye-catcher, any time I looked at the earrings I found some new beads and combos, they are summery, beach-y, bohemian and you did justice to the focal with the smart design of the necklace to keep it reversible and displaying all the colors of the focal! That ring is adorable! I love the long necklace – I have fallen in love with knotting and really like the way you used multiple strands. Very nice pieces! Very colorful and I like how you made the ring. Great job! Great use of the waxed linen on those earrings. I love them! The necklace,too, is such a pretty mix of colors and movement. I am inspired by what you made with your soup. I agree, the button needs no more than its own statement as a ring. Bravo! Love the heart necklace! Great soup!